Tunstead is a large parish in the North Norfolk Local Government District, and has an area of some 1127 hectares. The parish includes the settlements of Sco Ruston and Tunstead, and is situated very close to Coltishall, and just 4.5km north of Wroxham. The name ‘Tunstead’ is derived from the Old English words for farmstead, and ‘Sco Ruston’ is thought to be a hybrid of the Old Norse word for wood combined with the Old English words for brushwood settlement. 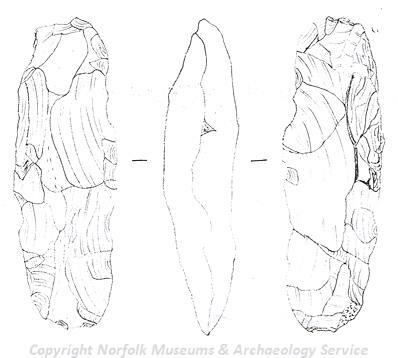 The earliest recorded objects from this parish are two Mesolithic flaked axeheads (NHER 35345, NHER 40040), a Mesolithic tranchet axe fragment (NHER 36660) and some possible Mesolithic flint flakes (NHER 37220). This parish has also been part of the Norfolk National Mapping Project which has sought to record and interpret the evidence of cropmarks, earthworks and soilmarks recorded by the aerial photographs. As a result, the earliest monuments recorded are those indicated by cropmarks. The earliest of these is a Neolithic mortuary enclosure or barrow (NHER 49359) which may be part of a large complex (NHER 49265) in the upper reaches of the River Ant. 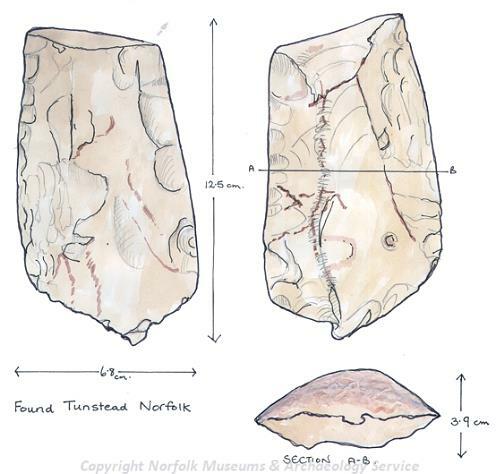 A large number of Neolithic objects have been recovered from this parish, and these include seven polished flint axeheads (NHER 7668, 14185, 35155), three flaked flint axeheads (NHER 8265, 28435 and 35037) a chipped flint chisel (NHER 8264), a strike-a-light (NHER 33123) and a scraper (NHER 40040). At least four probable Bronze Age ring ditches have also been recorded (NHER 36339 and 36725), one of which was recorded in conjunction with other enclosures (NHER 36338) and one in relation to possible Roman field boundaries (NHER 16732). An Early Bronze Age barbed and tanged flint arrowhead (NHER 8263) has also been recovered. A farmstead or enclosure of possible Bronze Age to early Iron Age date (NHER 49362) has been recorded, as well as one of Iron Age to Roman date (NHER 49361). Iron Age to Roman field systems have also been noted elsewhere (NHER 36748), and probably relate to another nearby site (NHER 49360). No Roman period monuments have been excavated, but a small number of objects have been recorded. These comprise coins minted under the emperors Antoninus Pius (NHER 8266) and Domitian (NHER 18303), pottery sherds (NHER 37202 and 40040) and a small number of metal objects such as a copper alloy key handle (NHER 20189) and a nail cleaner (NHER 37232). However an Early Saxon glass bead (NHER 7668) and a Late Saxon bridle bit fragment (NHER 37202) have been recovered. Tunstead is also listed in the Domesday Book, as is Sco Ruston, though the later appears to have been very sparsely populated even during this period. The deserted settlement of Clare (NHER 18616) is also thought to lie in this parish, though the exact site is not known. The earliest standing buildings are therefore the churches at Tunstead and Sco Ruston. The later, dedicated to St Michael (NHER 7692) is thought to be redundant and lacking a roof, but probably dates largely to the 14th century. By comparison, St Mary’s Church (NHER 8303) in Tunstead is a large and splendid building with a Decorated style nave and a Perpendicular style chancel. The building also has several interesting features which include an unusual raised platform-reliquary and crypt or strong room at the eastern end, and a spectacular flush work arcade on the south nave wall. Also dating to the medieval period are a number of field boundaries (NHER 49360), trackways and enclosures (NHER 36748), ditches (NHER 49365)and the site of a possible medieval or post medieval post mill (NHER 49366). A number of medieval objects have also been recorded and these include pottery sherds from eleven sites (such as NHER 33123, 40034 and 40044), and coins, including an Edward I silver penny (NHER 14682) from six sites (such as NHER 14681, 37232 and 37220). Metal objects such as cauldron fragments (NHER 37477 and 40031), an annular brooch (NHER 40039) and a seal matrix (NHER 39952) have also been recovered from sites across the parish. Similar post medieval objects have also been found. A small number of post medieval buildings of architectural interest have survived, and these include Tunstead Old House (NHER 8268) a 17th century brick cottage, and Manor House (NHER 13088), a 16th or 17th century flint or brick building. Also of interest is the 18th century Thatched House (NHER 14926), with its elaborate façade, and Anchor Farmhouse (NHER 46693), an 18th century flint and brick lobby-entrance plan building. World War Two also left its mark on the parish, with the site of a probable World War Two military camp near Old Farm (NHER 49377) recorded, as well as a bombing decoy known as Beeston St Lawrence (NHER 28452).